By controlling the temperature and the amount of carbon dioxide in the test chambers, scientists hope to learn how microbial communities, moss populations, various higher plant types and some insect groups respond. 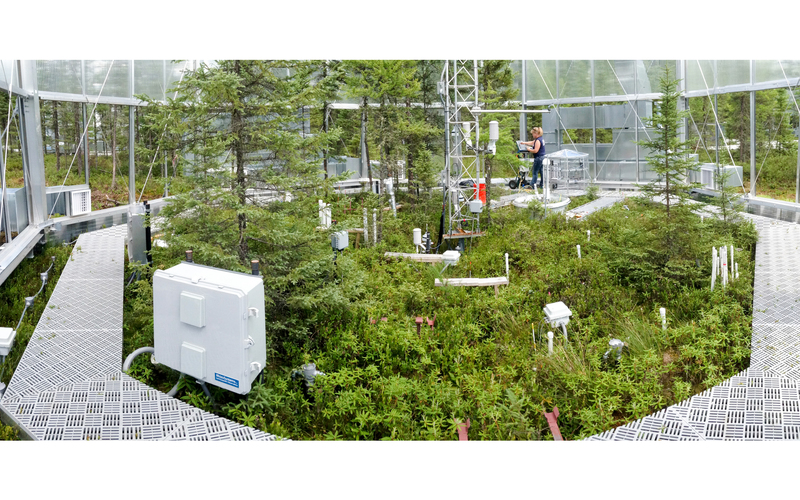 Scientists are getting a glimpse of the future with a Department of Energy large-scale experiment designed to answer questions about how carbon-rich peatlands will respond to projected warming of the climate and increases in atmospheric carbon dioxide. SPRUCE, which stands for Spruce and Peatland Responses Under Climatic and Environmental Change, was launched today at the experiment site about 25 miles north of Grand Rapids. Among those attending the ceremony were Gary Geernaert and Daniel Stover of DOE’s Office of Biological and Environmental Research; Thomas Schmidt, assistant director for research, U.S. Department of Agriculture Forest Service Northern Research Station; and Martin Keller, associate laboratory director of Energy and Environmental Sciences at DOE’s Oak Ridge National Laboratory in Tennessee. The site consists of about seven acres of raised bog in the peatlands of the Chippewa National Forest. The natural spruce bog in northern Minnesota contains more than 10,000 years of carbon accumulated from peatlands and answers to questions related to the predicted warming of ecosystems. Ten open-topped transparent enclosures – 12 meters in diameter by 8 meters high -- are the laboratories for the experiments to assess the ecological responses. The enclosures, superimposed on a belowground corral that isolates the peatland, will host measurements of microbial communities, moss populations, various higher plant types and some insect groups. “The SPRUCE experiment continues ORNL’s involvement in environmental change studies that are conducted in the real world at scales relevant to an ecosystems stature, biodiversity and biogeochemistry,” said Paul Hanson, who leads the project and is a member of ORNL’s Environmental Sciences Division and Climate Change Science Institute. With the ability to control heating of the air and soil within the enclosures to a depth of two meters, scientists hope to gain an understanding of the possible effects of projected higher temperatures on vegetation and ecosystems. While peatlands cover about 3 percent of Earth’s land surface, they contain up to 33 percent of the global soil carbon pool. Although that carbon dioxide has been trapped in the cold oxygen-poor environment for thousands of years, warming conditions threaten to see peatlands release large amounts of carbon dioxide and methane. This occurs through a combination of enhanced decomposition and aeration of surface peats. “SPRUCE is the first experiment to test the combination of warming and elevated carbon dioxide on carbon-rich peatland ecosystems,” said Randy Kolka, team leader and research soil scientist with the Forest Service, a partner in the project. The location in the peatlands of the Marcell Experiment Station, part of the Chippewa National Forest, was carefully selected by a team led by Hanson, who recalled how SPRUCE came about. “SPRUCE represents ORNL’s response to a 2008 directive from DOE to take our group’s expertise in large-scale manipulations off of the Oak Ridge Reservation into a new ecosystem important to the global carbon cycle,” Hanson said. Now, through SPRUCE, scientists from ORNL, the Forest Service, other DOE laboratories and universities can conduct experiments that couldn’t be done before.